It’s dangerous to go alone! Take this. – Where Is The Multiplayer In MMORPGs? Today I present to you an infographic that will guide you on your journey. 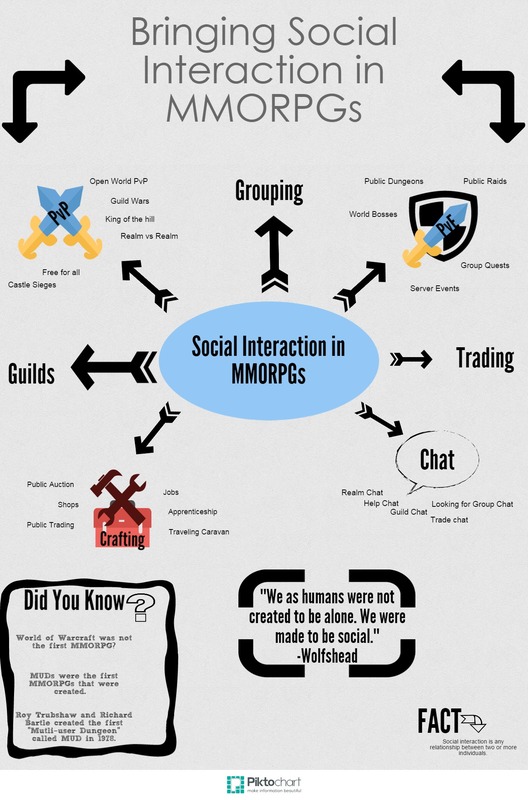 This infographic breaks down MMORPG mechanics that influence Social Interaction. Next to each core mechanic are lists of possible ways to increase social interaction in MMORPGs. We have to understand that MMORPGs are meant to have Social Interaction. The best way to do this is to make sure MMORPG mechanics and gameplay present ways that force players to interact with others. The possible ways to doing PvP, PvE or Trading can influence the way players play with each other. Ask yourself; what are some other ways that can increase Social Interaction in MMORPGs?